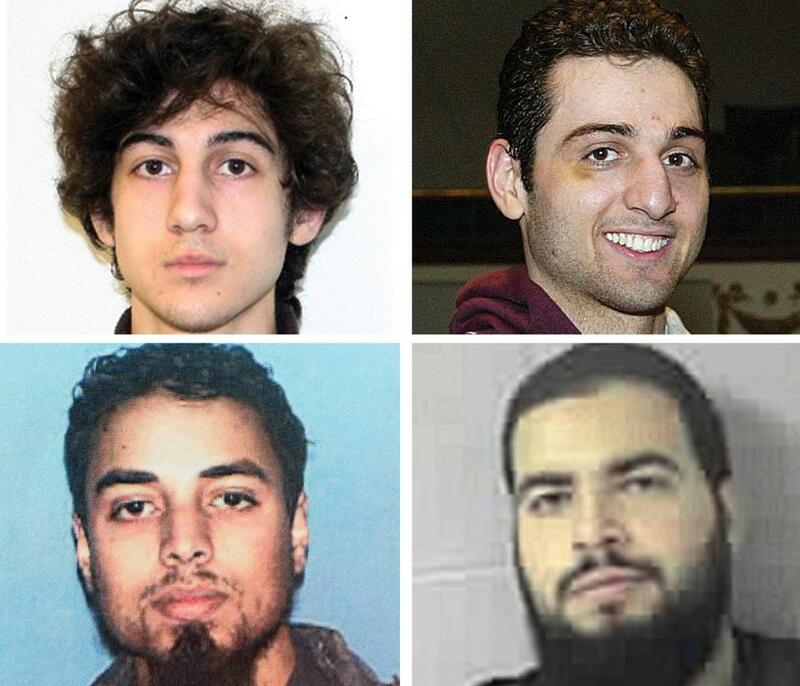 Are Boston terrorism cases a trend? Dzhokhar and Tamerlan Tsarnaev (top right and top left) carried out the Marathon bombings; Rezwan Ferdaus (bottom left) planned to crash model planes laden with explosives into government buildings; and Tarek Mehanna (bottom right) translated documents for Al Qaeda. The Tsarnaev brothers exploded bombs at the Boston Marathon. Tarek Mehanna translated documents for Al Qaeda from his Sudbury home. Ashland’s Rezwan Ferdaus planned to crash model airplanes laden with explosives into the Pentagon and US Capitol. All were homegrown terrorist plots in and around Boston in recent years. And then, last week, a Roslindale man who was being tracked by an antiterrorism task force and who allegedly had vowed to kill police officers was shot to death by investigators as he allegedly brandished a knife. These episodes raise a question: Is Boston more vulnerable to violent extremism than other parts of the country? Antiterrorism specialists interviewed by the Globe said there is no easy answer. Some said the region is no more likely to be home to extremists than anywhere else in the United States, while others suggested that Boston’s emergence as an international hub may leave it exposed to strains of radicalized behavior. “Clearly, there have been a number of incidents here, and some of that is because Boston is really an international city,” said former Boston Police Department commissioner Ed Davis, who is an international security consultant and a consultant to the Globe. Terrorism cases with ties to Mass. Rahim’s alleged plot was the latest in a series of terrorism cases with connections to the state stretching back to Sept. 11, 2001. J.M. Berger, coauthor of “ISIS: The State of Terror” and author of “Jihad Joe: Americans Who Go to War in the Name of Islam,” said there have been more incidents involving violent extremism in Boston than many other places, but not as many as in some cities, including New York. The Boston-area cases cannot be traced to one network, and individuals and groups do not appear to be connected, Berger said. Yet, he said, there was a “robust radical presence” in the Boston area in the 1990s, when members of the Al Kifah Refugee Center in Brooklyn, N.Y. — which was linked to the 1993 truck-bombing attack at the World Trade Center — moved to Massachusetts and operated an organization that sent fighters and supplies to Bosnia. Most of that group’s members were sent to prison or deported. “There is some degree of social network here that seems to be involved in radical thought, but very few radicals actually become violent,” Berger said. Even if there are remnants of that radical social network in the Boston area, Berger said, all of the recent local cases are not necessarily connected to it. “Unfortunately, ISIS has been more effective in inspiring people to carry out individual attacks,” Berger said, using an acronym for the Islamic State group active in Iraq and Syria. One of the few indicators of whether someone will become a violent extremist is with whom they associate, whether over the Internet or in person, Berger said. “If you’re friends with a violent extremist, you are likely to be one,” he said. James Forest, director of security studies at the University of Massachusetts Lowell’s Center for Terrorism and Security Studies, said many US cities have felt the threat of terrorism since Sept. 11, 2001. Boston, he said, is not an outlier. Forest, who also teaches at the Fletcher School of Law and Diplomacy at Tufts University, described the plots as “do-it-yourself terrorism,” inspired by groups like the Islamic State, but carried out locally. There have been nearly 70 terrorist plots and attacks by radical Islamists in the United States since 2001, according to the Heritage Foundation, a Washington, D.C., think tank. In early May, two men armed with assault rifles opened fire outside a contest for cartoons of the Prophet Mohammed before they were shot and killed. The Islamic State claimed responsibility. In March, two cousins were arrested in Chicago on charges of conspiring to provide material support to a foreign terrorist organization in a plot to attack a military instillation. In January, an Ohio man was arrested in connection with a planned attack on the US Capitol. Farah Pandith, the first-ever special representative to Muslim communities at the US Department of State in 2009, said the Islamic State is building “a virtual army” by targeting a specific demographic: “Muslim millennials,” under age 30, who grew up with social media. Pandith said the Islamic State is appealing to young Muslims who face an identify crisis; they come from a wide spectrum, including educated and uneducated, male and female, wealthy and poor, and countries with Muslim majorities and countries where they form a minority. Boston has been home to several terrorist plots since Sept. 11, 2001, when the two planes that crashed into the World Trade Center towers had left from Logan Airport. Dzhokhar and Tamerlan Tsarnaev detonated bombs near the Boston Marathon finish line in April 2013, killing three and injuring more than 260. In 2012, Ferdaus, 26, of Ashland, was sentenced to 17 years in prison for plotting to attack the Capitol and Pentagon with remote-controlled airplanes carrying explosives. A year earlier, Mehanna was convicted of providing material support to Al Qaeda. Prosecutors said he traveled with an associate, Ahmad Abousamra, to Yemen to join a terrorist training camp, but his plan failed. Abousamra, of Stoughton, who is on the FBI’s Most Wanted Terrorist list, was allegedly killed recently during an Iraqi airstrike, according to Britain’s Daily Mail and Al Arabiya television. In 2010, Aafia Siddiqui, a Pakistani woman who graduated from MIT and Brandeis University, was found guilty of the attempted murder of Americans serving in Afghanistan. Lorenzo Vidino, director of the Program on Extremism at George Washington University’s Center for Cyber and Homeland Security, said the number of terrorism cases in Boston is striking, and defies easy explanation. Vidino said proactive police work may be part of the explanation, unearthing cases that would otherwise stay in the shadows. “The more you dig, the more you’ll find,” he said. Shelley Murphy can be reached at shmurphy@globe.com. Follow her on Twitter @shelleymurph. Peter Schworm can be reached atPeter.Schworm@globe.com. Follow him on Twitter @globepete.